At home, all I’d heard of Penang was its curry. But on the ground, specialties are made at individual stalls and come with names as foreign as some ingredients. Roti canai is a popular breakfast bread, flaky and delicious like many pastries. Assam Laksa was the only dish on the menu at one little restaurant, which simplified their staffing numbers to two: chef/waiter and manager/busboy. ﻿Noodles in a flavorful soup topped with spices were slurped up by a pleased crowd. 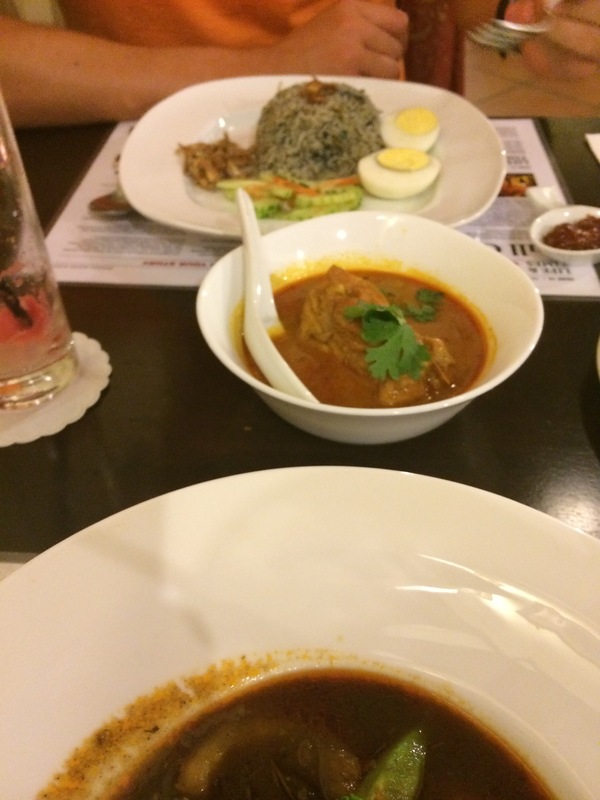 Do note, every menu in Penang claims to serve a “Best of….” dish. Blue rice flavored with floral spices accompanied by meat and sauce was a Malay specialty known as Nasi Lemak, while double fried pork understandably was a hit at the Chinese shop re-opened post new year holidays. Char Kway Teow (rice noodles with shrimp, chives, oysters and who knows what else) was best the first night at the hawker stalls, where we learned to order at the cart and magically they would find you at a table numbered but unremarked. I wanted to turn my plate over to see if it said “white girl, pink shirt, moderately sweaty” or some other secret code to find me between the time I ordered and sat at a table down the way. We didn’t complete all the dishes in Penang’s bingo menu many travelers seemed determined to conquer. Instead, we enjoyed familiar delicious Indian food and a pizza night. Our favorite? Cendal. Why this popular dessert hasn’t made it off the island is beyond me. Rather, it commuted from its Indonesian birthplace to find a home in Penang, but why is Penang curry a thing and not Penang desert? Visually and gastronomically, this soothing dish of shaved ice covered in mystery sauce and strangely sprinkled with red beans, green jelly noodles, peanuts and pearl jellies (boba). Strange as it may sound, it’s a hit on a hot day. We tried another shaved ice dish, many pastries but no more durian. Maybe other travelers do Penang first, so haven’t had Cambodian Lok lak or Laotian eggplant dishes yet. Or maybe we are just aren’t the food tourists dying to recreate Anthony Bourdain’s meals. While we had good meals here, I had a few episodes of hesitation wondering if Vietnam would have been a more compelling stop. I share this for honesty’s sake, for who would believe the traveller that gave every stop five stars?